?Monsieur Betancourt? Breguet, No. 88. Sold to Monsieur Betancourt in an 6 (1798) for an unspecified sum. Made between an 4 and an 5 (1796 to 1797) at a cost of 1378 Francs. Very fine and very rare, silver and gold pocket watch with jump hours, grande sonnerie striking and quarter repeating. C. Four-body, ?bassine unique?, by Joly, No. 833, polished, gold hinge and strike activation/ silence button in the pendant. Hinged silver cuvette. D. White enamel with Breguet numerals, outer minute track, slightly offset subsidiary seconds, secret signature below 12. Blued steel Breguet hands with open points. Gilt metal dial plate signed ?Breguet, No. 88?. M. 48 mm., 22''', full plate caliber, cylindrical pillars, two trains with spring barrels, cylinder escapement, three-arm brass balance, blued steel flat balance spring, index regulator, unpierced four-wheel Grande Sonnerie striking train striking on two gongs mounted inside the band, three position milled gold button on the pendant rotated clockwise to release the repeating, anti-clockwise to silence the striking, the middle position engages the strike train. Dial with secret signature, cuvette signed, case with Joly's Mastermark. Diam. 59 mm. C. Four-body, bassine unique, by Joly, No. 833, polished, gold hinge and strike activation/ silence button in the pendant. Hinged silver cuvette. D. White enamel with Breguet numerals, outer minute track, slightly offset subsidiary seconds, secret signature below 12. Blued steel Breguet hands with open points. Gilt metal dial plate signed Breguet, No. 88. The Breguet records confirm that this watch was initially delivered in a gold case. However, the repair books remark that in February 1838, when it was returned for overhaul, at the request of Monsieur Mariano de la Pedrueza, it was fitted with a silver case by Breguet. According to the hallmarks, the case was made after 1st April 1822. 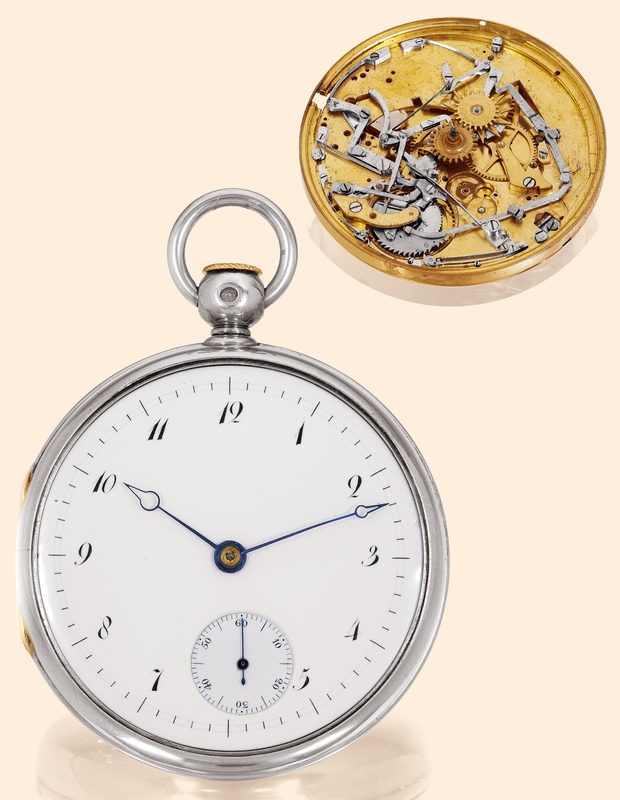 Breguet employed a button mounted on the pendant to operate several different forms of striking work on his earliest watches, and it is most likely the precursor for his invention of the pull-twist piston, later used for all the repeating watches. Furthermore, this watch is one of the earliest examples featuring a jump hour hand. The Arabic numerals are identical to those used by Jean-Antoine Lepine from about 1770, and the signature is typical of Breguet's work prior to the revolution. The case is stamped with the mark of Gustave Mermillod who is recorded as the first case maker working for Breguet.